When life includes mental illness (MI) how can having one more complication be good? Those are times God uses other people to magnify His love for us. We headed off to the ER. Thankfully, it was for me and not our son, Chris. I’d rather endure my physical pain than relive any emotional pain of Chris suffering. It all started a week ago with me vomiting on Wednesday night. So I only ate several tiny crackers on Thursday. Which I vomited Thursday night. The pain in my abdomen didn’t feel like a typical intestinal bug. So Friday I drove myself to the doctor, ignoring the searing pain of each bump and turn. Friday I followed the doctor’s instructions to drink colorless fluids, take my meds, and eat a bland diet. Saturday morning I tried eating some applesauce. My loss of appetite prevented me from finishing off the snack-size container. Could only manage about a tablespoon. By 10:00 AM Saturday morning, my condition hadn’t improved. Howie and I decided to head to the ER. We provided necessary information. They did some tests. We waited for results and provided more information. Eight hours later they admitted me and had a diagnosis. My enlarged gall bladder, complete with a gall stone, caused all the pain and discomfort. The decision was made to remove it. IV antibiotics had to be administered to reduce the size. My first night in the hospital proved to be exactly what others joke about. The constant interruptions. Time to wake up and take meds. An hour later, time to check vitals. Next hour, time to see if the IV is okay. I was well-taken care of and weary. Sunday morning Howie came to visit. Soon after, Chris arrived. What a blessing to have him come! The sweet time we spent together in the hospital almost made my pain worth it. Chris was so caring and compassionate. Howie and Chis left after a short visit. Later Sunday afternoon Howie called. What a considerate gesture! Chris made an effort to guarantee me better sleep. Even though the doctor had no power over the intercom, Chris’s thoughtfulness made my day. That second night in the hospital I still endured pain and interrupted sleep. But my heart was full of the love shown by Chris and Howie. God used my enflamed gall bladder to magnify His love in my life. 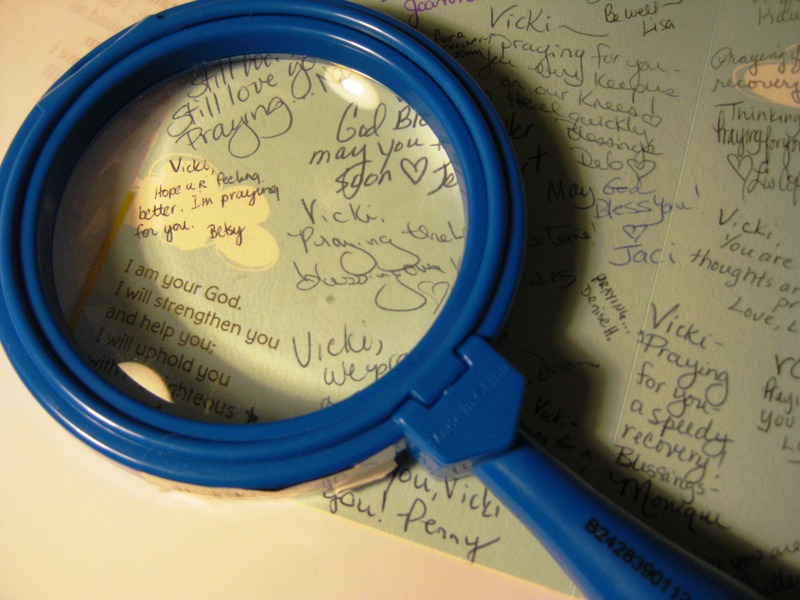 During trials, I’ve learned to be on the lookout for God’s love messages sent through others. He surely sends them because He’s surely there. And surely cares. Yesterday when I arrived home from the hospital another of God’s love messages greeted me. This time sent through the loving hands of former colleagues. On their first day back to school, those dear friends and Christian educators took the time to sign a get-well card for me. Their card was like a bouquet of blessings filled with promises of prayers. Thank You, Father, for magnifying Your love for me through family and friends. Help me make it a priority to magnify Your love. To open Your Word and closely examine how You show Your love. How beautiful You are the closer I am to You! Chris felt that he had some experience with hospitalization that you might need advise. He was able to feel knowledgeable about your situation. He must have been very proud of himself. You’re exactly right, Linda. I’m sure Chris not only felt proud of himself, but also thankful he could help me. Often we don’t understand why God puts us through various trials. It’s healing when we get a glimpse of His reasons. Chris visited me in the hospital bringing his expert advice. He had something more to offer me than a card or a get-well balloon.